COUNCIL BLUFFS – According to the Centers for Disease Control (CDC) in 2015, there were about 3,700 sudden unexpected infant deaths (SUID) in the United States. These deaths occur among infants less than 1 year old and have no immediately obvious cause. Methodist Jennie Edmundson Hospital is hoping to change those statistics, becoming just the 32nd hospital in the region to earn the Safe Sleep Hospital Champion Designation by the Nebraska Safe Babies Initiative: Safe Sleep Campaign. Methodist Jennie Edmundson will celebrate the award on Wednesday, May 23 at 10 a.m. in the Birthing Center. 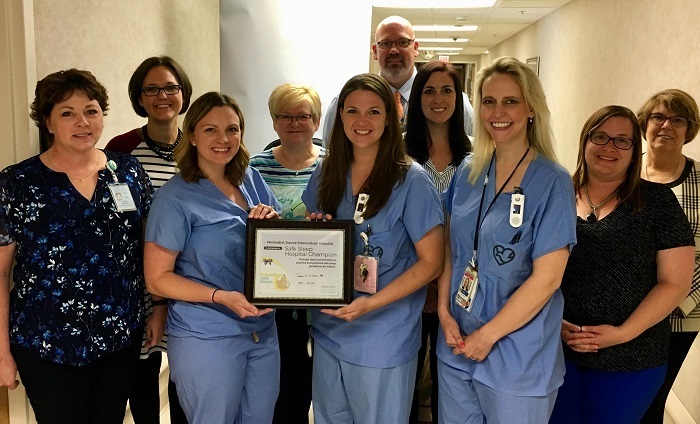 To earn the safe sleep designation, the staff at Methodist Jennie Edmundson Hospital in conjunction with Methodist Women’s Hospital, had to take and adhere to the safe sleep campaign pledge. They had to develop and update the safe sleep policy at both facilities. Ashley Nihsen, Clinical Nurse Educator, educated hospital staff on the new policy. Staff will provide safe sleep education to parents and families and the organization will participate in internal audits annually to ensure positive outcomes. So what are safe sleep recommendations? Remember A, B, C.
Your baby should always sleep alone. During baby’s first year, the safest place for a baby to sleep is alone in their crib, close to the parent’s bed. Room sharing is ok… bed sharing is not. Your baby should always sleep on his or her back. Babies should always be positioned on their backs to sleep – whether they’re napping during the day or in bed at night. Your baby should always sleep in a safe crib. It just really isn’t safe for baby to sleep anywhere other than a crib – that includes car seats, infant swings, adult beds, couches or chairs. Established in 1886 and affiliated with Methodist Health System since 1994, Jennie Edmundson Hospital, is a 230-bed regional health care center serving approximately 250,000 residents in southwestern Iowa. Jennie Edmundson Hospital employs a workforce of 464 full-time and nearly 250 part-time staffers, and has an active staff of 132 physicians. It is the only hospital in this region of the state with the capability to perform emergency angioplasty procedures and has southwest Iowa’s only accredited cancer program.